Chinese solar energy major, Trina Solar has launched Trina home, India’s first solar energy kit for residential use. It has targeted the renewable energy needs of households and small and medium enterprises in the country. 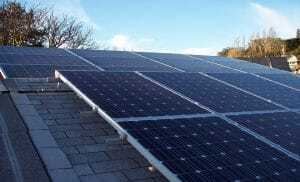 The kit comes in 3kW, 5kW and 10kW capacities and comprises rooftop components like the modules, inverter, grid box and mounting systems which differ for the variations. An app has also been included for the monitoring purpose of power generation. The Trina Home kits will be having a 25-year module performance warranty. It has been reported that the Chinese provider has signed an MoU with Andhra Pradesh for building a production unit in the state. Around 90 acres have been allotted for the purpose in Visakhapatnam. Yin Rong Fang, president of global sales, Trina Solar, said that the company intends to expand itself to the households and SME section with its Trina Home brand. It has also partnered with some local companies to fasten its distribution and sales network. The president also added that over 300 solar installers have been trained and 350 certificates issued in seven cities. While the price of the kit has not yet been revealed, an approximate cost of installing a 3kW unit has been estimated between Rs 150,000 to Rs 300,000. The company has a 15 per cent market share in India’s solar energy capacity of 23.1 GW and it aims to achieve its assembling target in its unit within four to six months. Gaurav Mathur, India director, Trina Solar, said that India is yet to achieve its rooftop target while its solar energy has been progressing. The Indian government has set a goal of achieving 100GW of solar energy capacity by 2022. Of this, 60GW is supposed to come from solar energy utility projects and 40GW from rooftop solar energy. Started in 2017, Trina Home has its presence in China, Asia Pacific, Middle East and Africa. India is said to be the company’s largest market in the Asia Pacific region. The brand has an aim to cater to a million households in five years.